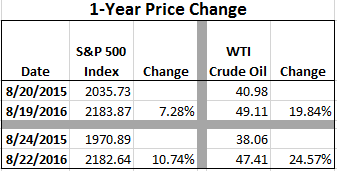 The S&P 500 Index was essentially flat today, down .06%; however, an investor's one year price only return will increase over three full percentage points from last Friday's close to today's close. For an investor invested in the S&P 500 Index, Friday's (8/19/2016) one year price only return equaled 7.28% and one day forward to Monday's close, the investor's one year return increases to 10.74%. The reason for this is the calendar rolling forward one day, weekends result in some nuances, and August of last year was a volatile month to the down side for the market and this is contributing to the magnitude of the change in return. 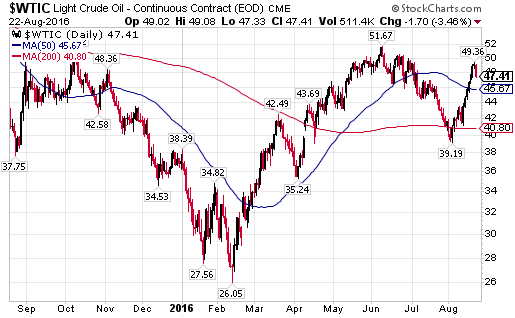 This same impact is resulting in large spikes in the one year rolling return for energy as energy prices were in the upper $30 range versus today's $47.41. 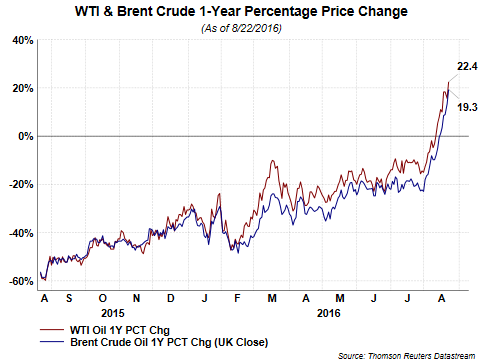 As time moves forward to year end, energy was falling into the mid $20/bbl area and if oil prices stay near current levels, the year over year price increase will be significant, nearly a doubling of the price of oil. 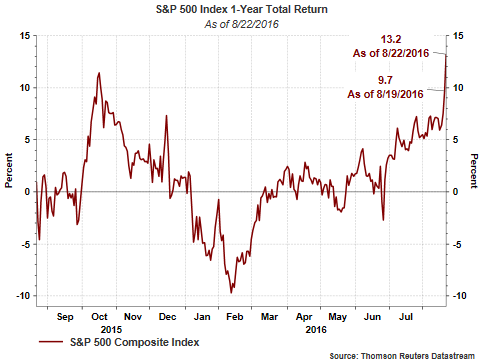 The interesting dynamic will be the impact on year over year earnings for the S&P 500 Index. S&P Dow Jones Indices has reported that the fourth quarter of 2015 as reported (bottoms up) earnings per share for the S&P 500 Index equaled $18.70. Projected bottoms up per share earnings for the S&P 500 at 12/31/2016 equals $29.30. 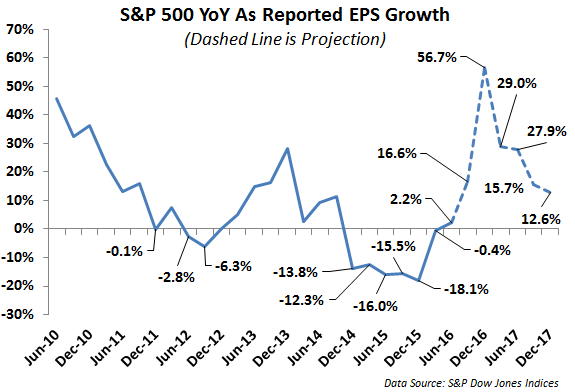 On a year over year basis, earnings growth will equal over 56%. Some of the recent equity market strength is a result of this anticipated improvement in earnings growth for companies and it will be significant assuming it continues on its current path. As is often the case, the stock market follows earnings (flat earnings in 2015 and flat equity returns) and the YoY double digit S&P 500 return is moving towards the YoY 16.6% anticipated growth rate for bottom up earnings in Q3 2016. Not sure I would want to be a stock market bear at the moment. Jobs Were The Missing Link?